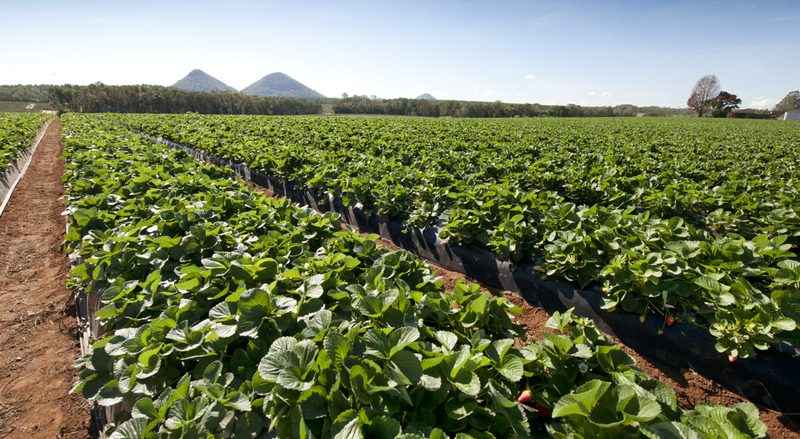 Mild, clear blue-sky winter days typical of Wamuran, south-east Queensland, are ideal for producing the sweet, flavoursome strawberries we are renowned for. Our 45-hectare farm produces fruit for four months of the year, with the peak period between August and September. Every season, we plant more than 2.4 million strawberry runners and employ some 300 people during harvest time. We grow a range of varieties – all selected for their flavour, colour, eating experience and yield performance – and we trial more every year. With all our strawberries, we aim to produce berries of a consistent size and shape – typically conical with plump shoulders tapering to a point and solid centres. Under-bed trickle irrigation waters the crop daily in the growing season and we fine-tune plant nutrition to achieve flavoursome fruit. About 10 weeks after planting, the first fruit reaches maturity. Each plant is checked for fruit every second day throughout the harvest and can produce dozens of berries. Each piece of fruit is selected and plucked off the plant by hand and placed into trays in the field. Once it reaches the packing shed, fruit is refrigerated to retain freshness, before being packed into punnets and sent to supermarkets.